The UAE is celebrating its 47th National Day on Sunday, December 2 with special events planned this year to mark the conclusion of activities for the ‘Year of Zayed’, which commemorates the 100th birthday of the country’s founding father Sheikh Zayed bin Sultan Al Nahyan. With the UAE announcing holidays on Sunday and Monday (December 2 and 3), most workers in the country have a long weekend. Here are some of the best places to celebrate the 47th UAE National Day in the country. The aim for this year’s National Day is to portray the UAE’s rich cultural heritage and its exciting future. A mega show, themed ‘This is Zayed. This is UAE’ will be held at the Zayed Sports City stadium on December 2. According to organisers, over 22,000 people are expected to witness the “historic celebration”, which will include “a breath-taking show that will take spectators through an immersive experience of live performances and stunning digital art”. Festivities at the mall will begin from 2pm where you can watch an Ayala dance performance. The annual Festival City fireworks will also take place on the 2nd at 8pm to 10pm. 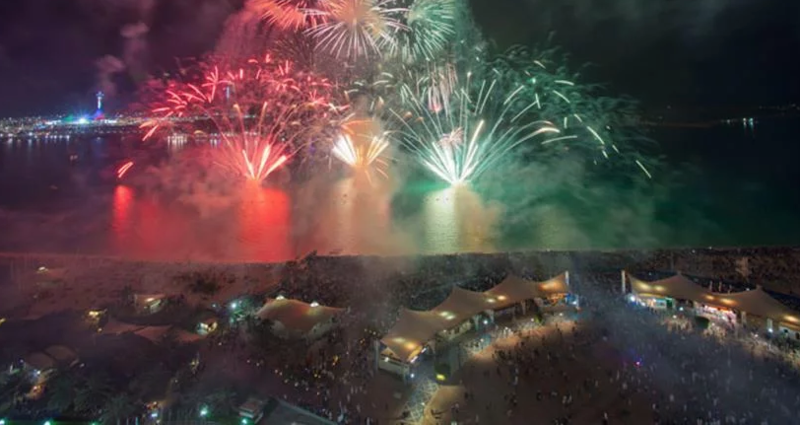 The fireworks display will light up the Dubai sky with the colours of the UAE flag over Festival Bay. The best places to witness the Abu Dhabi firework display at 8pm are at the Zayed Heritage Festival, Hazza bin Zayed Stadium, Madinat Zayed, Al Dahfra and at the Abu Dhabi Corniche at 9pm. Before the fireworks in Abu Dhabi, you can witness the air show display put on for National Day. The display of aerial maneuvers will take place along the Abu Dhabi Corniche with special appearances from the air force’s Mirage 2000 and F-16 jets. A firework display will take place along the Dubai coastline for this National Day. There will also be live music with special guest appearances. On December 1, Fouad Abdul Wahed will perform his popular songs ‘Ya Hob’ and ‘Qalbi ElSagheer’ among others. On December 2, a live performance will be given by Mohammed Al Shehhi, who will be playing a remix of western beats and Arabic compositions. Burj Park will also host live concerts by regional artists. On December 1, at the open air venue, Waleed Al Shami will perform, followed by local star Ahlam – a judge on MBC’s Arab Idol. On the following day (December 2), more local musicians will take to the stage, including Balqees and Hussain Al Jasmi, who are expected to take to the stage together. The event will run from 6pm until midnight. Parades are held annually across all the emirates in the country. In Dubai, revellers can head to the Mohammed bin Rashid Boulevard with Downtown Dubai also expected to host a show with floats, supercars and bikers. Famous independent Arabic singer Hamad Al Amri will be performing at Dubai’s Global village to celebrate the 47 years of the UAE. Global Village also has a range of other entertainment options including food and shopping from different countries. Ticket entry is Dhs15 per person, which also covers the concert. Abu Dhabi’s Yas Island theme park Yas Water World is hosting a big ‘Water Battle’. A fun way to celebrate UAE National Day, families can choose from different coloured water pistols and engage in a water battle in the Amwaj battle arena. Water guns will be handed out for free on a first come basis. It begins at 11:47am on December 2. While Yas Marina circuit is still hot from the Grand Prix last weekend, they are hosting a Gulf heritage themed event with three days of entertainment. Activities for all ages take place from December 1 to 3 from 3pm to 7pm each day. There will also be a firework display at 7pm on December 2. Several National Day events are taking place throughout the weekend at Dubai mall Times Square. Some of these include Arabic food tastings, falcon display, Henna hand painting, basket weaving, fresh date tasting, embroidery and fish net making. The events run from November 30 to December 3 from 12pm to 8pm.